James II and VII (14 October 1633 – 16 September 1701) was King of England and Ireland as James II and King of Scotland as James VII, from 6 February 1685 until he was deposed in the Glorious Revolution of 1688. He was the last Roman Catholic monarch to reign over the Kingdoms of England, Scotland and Ireland. Speech to Parliament (30 May 1685). James II was neither so clever, nor so subtle as his brother. As we have seen, he was incapable of dissembling the Catholicism that so alarmed his subjects. Instead, from the moment he became king he worshipped openly and ostentatiously, asking Sir Christopher Wren to design an elaborate Catholic chapel at Whitehall. As his piety might seem to imply, James II was not as fun-loving as Charles II. At the beginning of his reign he banished from Whitehall all the men and women of pleasure, including (albeit temporarily) his own mistress, Catherine Sedley, countess of Dorchester (1657-1717). In some ways, this sobriety was not such a bad thing after the scandalous behavior of the "Merry Monarch." The Crown needed to restore its dignity and it needed to save money. The new king was not afraid of attacking entrenched interests and his orderly mind caused him to launch a major "downsizing" of the court, eliminating sinecure offices and much of the fee-taking system. The result was a smaller, more efficient, and thriftier court- but also one which was much less exciting and lucrative- than his brother's had been. In short, James II may have been an excellent administrator, but he was a terrible politician. A soldier since youth and a Roman Catholic for nearly two decades, he craved order, hierarchy, obedience. He regarded questioning or disagreement from his subordinates, whether in Parliament, the court, or the military, as signs of disloyalty. Consistent with this, he was a lifelong absolutist. In James's view, his father's (Charles I's) only mistake was to make concessions. Above all, James II was convinced of the truth of the Roman Catholic faith and of his moral duty, as king, to bring his people back into the fold- regardless of their individual feelings on the matter. In his defense, James probably had no intention of persecuting his Protestant subjects into conversion or oblivion a la Bloody Mary. Rather, he seems to have believed that, if all Christian faiths were put on equal footing by a toleration, thus creating a free market of ideas and discourse, his subjects would see the self-evident truth of the Old Faith as he had done. Somewhat ironically given the rigid nature of James's personality, the pursuit of religious toleration became the major policy initiative of his reign. Historians have debated his sincerity ever since. But whatever his motivation, as in his administrative reforms, this otherwise old-fashioned and conservative man was too far ahead of his times for his own good. Finally realizing the seriousness of William's preparations, in late September James tried to back-pedal, abolishing the Ecclesiastical Commission, restoring the old city charters and their Anglican Tory oligarchies, and promising to call a free parliament. This did nothing to placate the Tory clergy or gentry or attack Whig townspeople; instead it demoralized Catholics and threw the local government of the nation into confusion. Soon after hearing that William had landed, James developed a massive nosebleed- probably a psychological reaction. At first glance, the king's panic makes no sense. He had at his immediate disposal 25,000 troops encamped on Salisbury Plain, squarely between William, at Exeter, and London. His coffers were full. He had "home-field" advantage. And there had not been a successful invasion of England since the Wars of the Roses. James should have been able to throw William into the sea in a matter of weeks, if not days. But he must have realized that his forces were largely untested and divided in religion and loyalty. Nor could he have been encouraged by his own obvious personal unpopularity. Perhaps his father's fate haunted him. In particular, the ruling elite seems to have taken a wait-and-see attitude to William's invasion. But as James hesitated to act, his support began to evaporate. The first to go over to William was Edward Hyde, Viscount Cornbury (1661-1723), the king's own nephew. By mid-November, the lords lieutenant who had been asked to raise the militia did so- and then marched it over to the prince of Orange: Lord Delamere (1652-94) gave his Cheshire tenants a choice, "whether [to] be a slave and a Papist, or a Protestant and a Freeman." Thus, at the moment of crisis James II turned out to be vulnerable on the last long-term issue that had cost his father the crown, that of local control. Ultimately, that control still rested with the landed aristocracy who held estates in the localities. 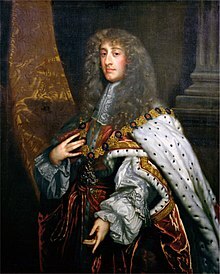 In the course of two successive mornings between November 23 and 25, James awakened to find that his other son-in-law, Prince George, his dearest friend, Lord Churchill, and the head of the most staunchly Royalist family in England, James Butler, second duke of Ormond (1665-1745), had gone over to William. On the 26th he learned that Princess Anne had also fled the court, leading James to lament, "God help me... my own children have forsaken me." At this point the king decided that the game was up. He abandoned his army and hurried back to London by coach. Once there, he put Queen Mary Beatrice and Prince James into a boat for France. On the night of December 11 he threw the Great Seal (required for registering statutes) into the Thames and attempted to make his own escape. He botched even this when he was discovered, disguised, while attempting to board a boat bound for the continent. The king returned briefly to London but, despite the urging of a number of Tory peers, he had no intention of staying. By the same token, William had no desire to see his inconveniently returned father-in-law. So, when James requested to go to Rochester, on the extreme east of Kent, there were no objections. The unfortunate monarch took advantage of this location and made his second, successful escape attempt on December 23. The Restoration Settlement was at an end. Put another way, the Great Chain of Being had been broken once again within a generation. James ascended the throne with all the ease of Richard Cromwell. He took every measure which forethought could enjoin to grasp the royal power, and his earliest declarations carried comfort to an anxious land. He tried to dispel the belief that he was vindictive or inclined to arbitrary rule. "I have often heretofore ventured my life in defence of this nation, and I shall go as far as any man in preserving it in all its just rights and liberties." He declared himself resolved to maintain in both State and Church a system of government established by law. "The laws of England," he said, "are sufficient to make the King a great monarch." He would maintain the rights and prerogative of the Crown, and would not invade any man's property. He is even reported to have said that "as regards his private religious opinions, no one should perceive that he entertained them." Nevertheless, from the moment he felt himself effectively King, on the second Sunday after his accession, he went publicly to Mass in his chapel. The Duke of Norfolk, who carried the sword of state before him, stopped at the door. "My lord," said the King, "your father would have gone farther." "Your Majesty's father would not have gone so far," rejoined the Duke. During the whole of 1686 and 1687 James held Parliament in abeyance, and used his dispensing power to introduce Roman Catholics into key positions. Whigs and Tories drew closer together. James was uniting the party that had challenged his brother with the party that had rallied so ardently his brother's defence. He now embarked on a political maneoevre at once audacious, crafty, and miscalculated. Hitherto he had striven only to relieve his Catholic subjects. If Whigs and Tories were combined he would match them by a coalition of Papists and Nonconformists under the armed power of the Crown. In William Penn, the Quaker courtier and founder of the state of Pennsylvania across the seas, influential in both this and the former reign, he found a powerful and skilled agent. Thus did the King break down the national barriers of his throne and try to shore it up with novel, ill-assorted, and inadequate props. In England during the autumn of 1688 everything pointed, as in 1642, to the outbreak of civil war. But now the grouping of the forces was far different from the days when Charles I unfurled his standard at Nottingham. The King had a large, well-equipped regular Army, with a powerful artillery. He believed himself master of the best, if not at the moment the largest, Navy afloat. He could call for powerful armed aid from Ireland and from France. He assumed that the Church of England was paralysed by its doctrine of nonresistance, and he had been careful not to allow any Parliament to assemble for the collective action. Ranged against him on the other hand were not only the Whigs, but almost all the old friends of the Crown. The men who had made the Restoration, the sons of the men who had fought and died for his father at Marston Moor and at Naseby, the Church whose bishops and ministers had so long faced prosecution for the principle of Divine Right, the universities which had melted their plate for Charles I's coffers and sent their young scholars to his armies, the nobility and landed gentry whose interests had seemed so bound up with the monarchy- all, with bet heads and burning hearts, must now prepare themselves to outface their King in arms. Never did the aristocracy or the Established Church face a sterner test or serve the nation better than in 1688. They never flinched; they never doubted. But now successive desertions smote the unhappy prince. Lord Cornbury, eldest son of the Earl of Clarendon, an officer of the Royal Dragoons, endeavoured to carry three regiments of horse to William's camp. James, warned from many quarters, meditated Churchill's arrest. On the night of November 23, having failed to carry any large part of the Army with them, Churchill and the Duke of Grafton, with about four hundred officers and troopers, quitted the royal camp. At the same time the Princess Anne, attended by Sarah Churchill, and guided by Bishop Compton, fled from Whitehall and hastened northwards. And now revolt broke out all over the country. Danby was in arms in Yorkshire, Devonshire in Derbyshire, Delamere in Cheshire. Lord Bath delivered Plymouth to William. Byng, later an admiral, representing the captains of the Fleet, arrived at his headquarters to inform him that the Navy and Portsmouth were at his disposal. City after city rose in rebellion. By one spontaneous, tremendous convulsion the English nation repudiated James. The King, finding resistance impossible, assembled such peers and Privy Counsellors as were still in London, and on their advice entered into negotiations with the Prince of Orange. Meanwhile the invading army moved steadily forward towards London. James sent his wife and son out of the kingdom, and on the night of December 11 stole from the palace at Whitehall, crossed the river, and road to the coast. He endeavoured to plunge his realm into anarchy. He threw the Great Seal into the Thames, and sent orders to Feversham to disband the Army, and to Dartmouth to sail to Ireland with what ships he could. The London mob sacked the foreign embassies, and a panic and terror, known as the "Irish Night," swept the capital. Undoubtedly a complete collapse of order would have occurred but for the resolute action of the Council, which was still sitting in London. With some difficulty they suppressed the storm, and, acknowledging William's authority, besought him to hasten his marches to London. James in his flight had actually got on board a ship, but, missing the tide, was caught and dragged ashore by the fishermen and townsfolk. He was brought back to London, and after some days of painful suspense was allowed to escape again. This time he succeeded and left English soil for ever. But though the downfall and flight of this impolitic monarch were at the time ignominious, his dignity has been restored to him by history. His sacrifice for religion gained for him the lasting respect of the Catholic Church, and he carried with him into lifelong exile an air of royalty and honour.